A Liberal's Libretto: Send in the clowns? 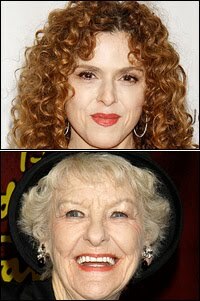 Playbill.com has learned that Tony Award winners Bernadette Peters and Elaine Stritch have been approached to succeed Catherine Zeta-Jones and Angela Lansbury, respectively, in the roles of the captivating actress Desirée Armfeldt and her worldly-wise mother Madame Armfeldt. Now - THAT would be a cast *not* to be missed! Wow. And, yikes. For more information - check out the Playbill.com Exclusive.